SAP applications, platforms, and business networks continue to open up through APIs – to facilitate ecosystem-driven innovations and seamless integration. APIs in SAP solutions use various protocols, documentation and access mechanisms. Application and integration developers on SAP Cloud Platform need to have a consistent overview of the APIs available in the relevant SAP systems (deployed on-premise and in the cloud). Testing APIs and building prototypes also involves organizing access to relevant systems and tenants for application developers. SAP Cloud Platform API Management can drastically reduce the time to build application and integration in addition to guaranteeing the benefits of security, traffic management and deep-analytics.It reduces complexity by leveraging a single provisioning platform (API Platform) to provide unified access and governance of APIs across a heterogeneous landscape. SAP API Management also enables you to share digital assets and engage with developer, partner communities to consume these assets in new channels, devices and user interfaces. In the blog series we will be showcasing features of SAP Cloud Platform API Management that enables enterprise digital application development addressing today’s need of faster time to market, agility and reduced costs. SAP API Business Hub integration with SAP Cloud Platform API Management allows you to discover, search and explore APIs from SAP and select partners in SAP API Business Hub covering APIs from SAP S/4HANA Cloud, SAP SuccessFactors, SAP Leonardo Machine Learning, SAP Hybris, Concur and more from API Portal. Application developers can quickly build extensions application (such as for Line of Business applications), mobile applications or web applications by consuming the SAP API Management managed APIs directly from SAP Cloud Platform Web IDE or iOS SDK Assistant. API Designer of SAP Cloud Platform API Management enables application developers to define the enterprise micro services in an API First approach in Open API Specification format and generate multi target (mtar) server application code in a programming language of your choice ( JAX-RS, NodeJS, Spring). Building an enterprise application is not just about programming the core functionality, it is also about how DevOps will manage, operate the application, handle continuous development and maintenance and much more. Decoupling the actual API endpoint using SAP Cloud Platform API Management enables API Management as the access point to the actual API implementation, hiding internal information and providing specific behaviors that otherwise would need to be coded in the API itself, such as Authentication, Traffic Management or Data Transformation. 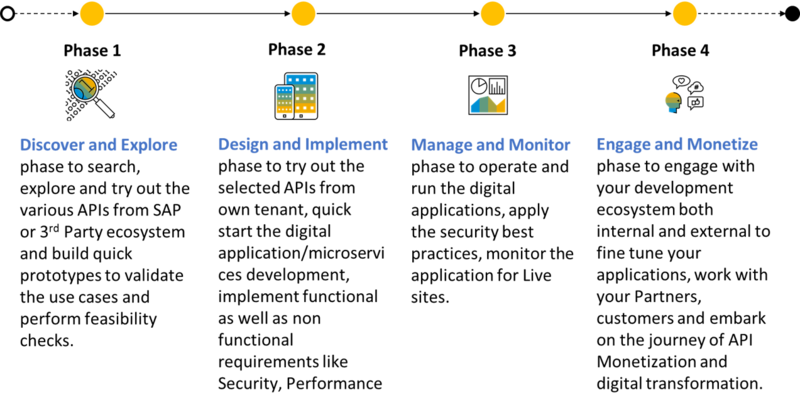 Out-of-the-box developer portal from SAP Cloud Platform API Management to engage with internal, partner or ecosystem developers enables engagement with developer and partner ecosystem. API Monetization and Data insights into API traffic helps drive API economy faster and use API products to monetize data in a pay per use model.